Southern France tradition, the art of boutis was highly prized in the 17th and 18th centuries. The boutis is embroidery on two sewn cloths, giving printed or plain motifs a raised pattern, and filled inside with a layer of cotton. Boutis is the art of embroidering from the inside, a quilting technique that one finds especially in Provence and the Languedoc-Roussillon region of France. 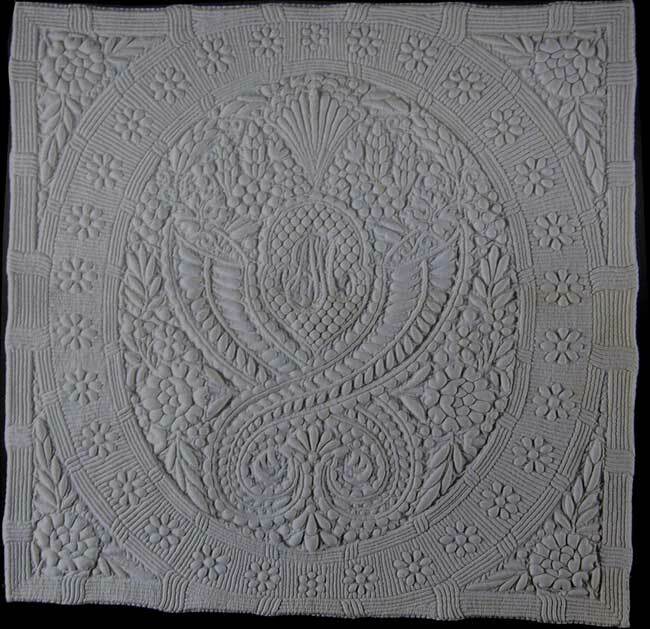 It's not to be confused with the "piqué de Marseilles," which is achieved with simple quilting while boutis is itself a product of a much more complex technique. 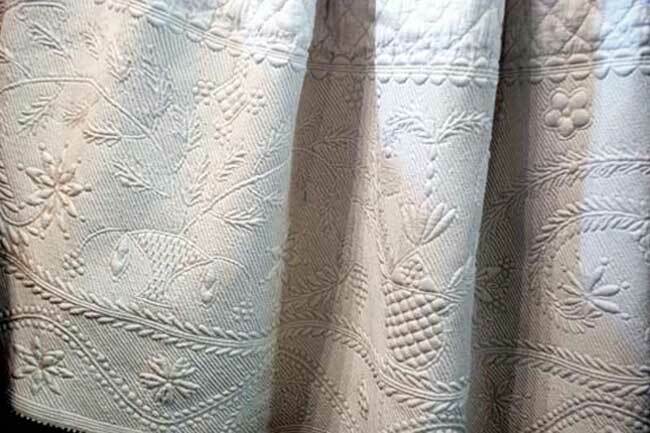 Two fabric layers are stitched together (the top in fine white linen batiste although sometimes in red, yellow, or floral print fabric) with small, tight stitches creating the forms of traditional symbols and monograms. Then, within the lines of stitches forming a shape, one delicately inserts a tiny tuft of cotton, giving relief to the surface of the work. Thanks to the examples of boutis that remain, it's possible today to step back into the bourgeois art of 18th and 19th century life in France. Bonnets and caps, bridal petticoats, infant blankets, marriage throws called "vannes." Piqué de Marseille coverlet, early 19th C.